This book gathers the voices of four local Hong Kong theologians to reflect on the 2014 democracy protests in the city from the perspectives of Catholic social teaching, feminist and queer intersectionality, Protestant liberation, and textual exegesis. The volume also includes an extended primer on Hong Kong politics to aid readers as they reflect on the theology underlying the democracy protests. September 28, 2014 is known as the day that political consciousness in Hong Kong began to shift. As police fired eighty-seven volleys of tear gas at protesters demanding “genuine universal suffrage” in Hong Kong, the movement (termed the “Umbrella Movement”) ignited a polarizing set of debates over civil disobedience, government collusion with private interests, and democracy. 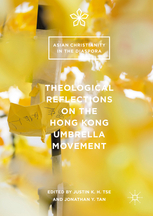 The Umbrella Movement was also a theological watershed moment, a time for religious reflection. This book analyzes the role that religion played in shaping the course of this historic movement.